43mm stainless steel case, sapphire crystal back, non-screw crown with 1 o-ring, domed sapphire crystal with double anti-reflective coating, anthracite dial with black numerals on applique hour circle, automatic winding monopusher chronograph Montblanc MB R200 movement with 30 min and 60 sec counters with rotating discs, second time zone with day and night display, approximately 72 hours of power reserve with triple-folding buckle, stainless steel bracelet. Water resistant to 3 bar (30 m). 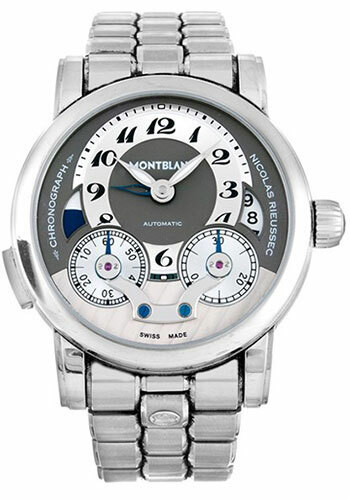 43mm stainless steel case, sapphire crystal back, non-screw crown with 1 o-ring, domed sapphire crystal with double anti-reflective coating, black dial, automatic winding monopusher chronograph Montblanc MB R200 movement with 30 min and 60 sec counters with rotating discs, second time zone with day and night, approximately 72 hours of power reserve, black alligator strap. Water resistant to 3 bar (30 m).